An informal, intimate and alfresco wine tasting cycling experience. Saddle up and join our knowledgeable guide on a journey through Bristol to find out what is so exciting about English wines. Cycle through scenic Bristol to handpicked venues and beautiful backdrops, sipping and sampling award-winning wines gathered from nearby vineyards. The tour follows flat, car-free routes soaking up the best of Bristol’s landmarks, stopping for several tastings, served to you from the back of a bicycle. You can also expect to stop along the way for cheese-pairing at Britain’s best cheesemonger! 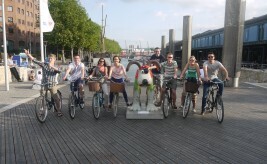 Join the Cycle the City wine tasting tour for an intimate, informal and at times alfresco wine tasting. What to find out more? Read our blog post, here. Bookings: Group sizes are kept small and bookings are required using the online booking calendar. Do call for last minute availability though! When: Tours run on Saturday lunchtimes at 12noon. Meeting Point: No.1 Harbourside, next door to the Tourist Information Centre. Price: £40 (including wine & cheese). Join us on a culinary journey through Bristol’s best bites and award-winning independent eateries as we explore Bristol’s cutting-edge food scene.